Most of us that have any reason to visit RF Cafe know what a watt is both from a DC, Ohm's Law perspective and from an RF power perspective. Some, though, are not quite sure what an audio watt is, as far as whether it is the same a watt of DC or a watt of AC (sinewave or not?). This short article from the August 1955 Popular Electronics answers the question. To accomplish useful work, whether it be moving a car along the highway or moving the cone of a loudspeaker to produce sound, power must be expended. The more power expended, the more work done. Mechanical power is generally expressed in horsepower and electrical power in watts or kilowatts. The concept of electrical power is important to the audio hobbyist because almost every element of a tape recorder or hi-fi rig generates, transmits, or absorbs power-electrical watts. The end result is the driving of the loudspeaker, and since the air opposes movement of its cone or diaphragm, power must be expended to overcome that opposition. In the case of the loudspeaker, the driving power is furnished by the amplifier which is rated as having an output of 10, 20, or more audio watts. It follows that the speaker must also be rated as to the electrical power or wattage it can absorb. This value should be at least equal to the amplifier rating, and in the case of several speakers, the combined power rating should equal the amplifier rating. Within the amplifier, the most obvious element important from an audio wattage standpoint is the output transformer. This is the last component in the final stage of the amplifier, and is the component that the loudspeaker "sees." The output transformer is a device which matches output tubes to the speaker voice-coil. If the amplifier is rated at 10-watts output, the transformer must be able to handle this power. If it is too small, distortion or burn-out may occur. Another element within an amplifier which is important, wattage-wise, is the lowly resistor. There are many of these in the average amplifier, although not all of them handle appreciable power. Resistors are available in many different resistance ratings in ohms, and in various power ratings. In home amplifiers, the resistor power rating may range from one-quarter watt to several watts. The resistor rating is important at some positions in the amplifier circuit since the current forced through the resistor by the applied voltage results in absorption of power by the resistor. This power is dissipated as heat, and a resistor of correct resistance value but with too low a power rating may fail completely or cause noise in the amplifier output. These two instruments are typical of the commercially available units for measuring audio watts. 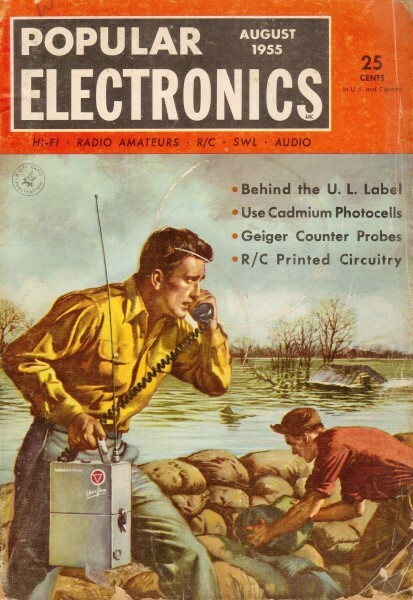 At the right is the Heathkit Model AW-1, which utilizes the v.t.v.m. principle to measure a voltage across internal load resistors. 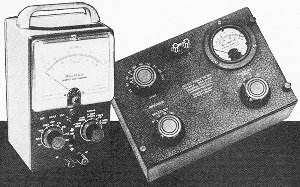 On the left is the General Radio Model 583A, a professional laboratory unit. Both of these instru­ments have provisions for matching the impedance of the amplifier under test. It might be well here to distinguish between the audio power input and the 115- volt house a.c. input to the amplifier. For 10 watts of audio output, the house system must furnish several times that much power to the amplifier 115-volt a.c. input. On the other hand, the microphone or record player furnishes only an extremely minute amount of program power to the amplifier audio input. This tiny audio input power, ranging from a few microwatts to milliwatts, in effect controls the 115-volt power that the amplifier draws from the house a.c. system, which is the real source of the power fed to the loudspeaker. Fig. 1. This is the test arrangement for measuring the power output of a hi-fi amplifier. The vacuum-tube voltmeter must be sensitive enough to read the extremely small voltage input to the amplifier as specified by the manufacturer, which may be only a few millivolts. Output wattage is equal to the square of the voltage as measured by the v.t.v.m. divided by the value of the resistance of the load resistor; this resistor is a substitution for the speaker. The oscilloscope is not required for actual wattage measurements, but enables the sine-wave pattern to be checked for distortion. Power output is measured at various frequencies over the response range of the amplifier. See text for details. Continuous power of one watt delivered to the speaker will result in an uncomfortably loud program in the average living room. The question then arises: why use amplifiers rated at 10, 20 or more watts? The cone-type speaker has a very low efficiency. This means that only a small fraction of the electrical or audio power fed to the speaker creates useful sound (horn­type speakers are more efficient but are less common in home systems). Another reason for building considerable power output into amplifiers is the fact that there are many instantaneous peaks of sound in music which are far above the average level; lack of power capacity in the amplifier will result in distortion on these peaks. Still another reason is the need for reserve power when a room full of guests creates a high background noise level - or when the hi-fi fan insists on turning up the volume for better reproduction of the extreme lows and highs. The need for reserve power becomes more apparent when it is realized that doubling the audio output from the amplifier will achieve only a moderate increase in loudness. While most amplifiers will deliver more than their rated output, the distortion percentage will generally rise above the manufacturer's stated value, which is the percent of harmonic distortion at rated output. A really high-fidelity amplifier will deliver its rated output with 1 % distortion or less. Figure 1 shows a simple setup for measuring amplifier output power. A sine-wave audio oscillator furnishes a steady signal at a particular frequency, perhaps 1000 cycles, to the amplifier input. Amplifier output is loaded by an appropriate resistor in place of the speaker (see speaker impedance rating). A vacuum-tube voltmeter - and an oscilloscope if available - is in parallel with the resistor. Amplifier volume control is set at the point at which the output is to be measured and the oscillator control is adjusted to obtain the amplifier input voltage recommended by the manufacturer. Output of the amplifier in watts at this 1000-cycle frequency will be the square of the voltmeter reading divided by the resistance of the resistor. The purpose of the oscilloscope is to observe the output waveform for distortion. When the waveform begins to depart from a smooth sine wave, the amplifier output contains distortion which, as mentioned earlier, must be considered along with the power output. The method of measuring audio power just described is well within the capability of the audio hobbyist who has an audio oscillator and a vacuum-tube voltmeter sensitive enough to read the minute output of the oscillator as well as the amplifier output voltage. For the hobbyist who desires to make his own wattmeter, a simplified design using a crystal element is shown in the Sylvania Electric Products Inc. booklet called "Forty Uses for Germanium Diodes." The Heath unit shown in the photograph is sold as a kit for home construction.